At eFulfillment Service (EFS), we have the privilege of working with many ecommerce sellers from around the world, those with a range of unique stories, businesses, and products. One such client is Jackson Cunningham, whom we’ve had the opportunity to work with for years to provide warehousing and order fulfillment services for his multiple online businesses. Jackson and his partners recently started the company, Tuft + Paw, after an eye-opening trip to Colombia that set them on a mission to help improve the treatment of cats around the world. Tuft + Paw was created to offer distinctive products that not only humans will love, but those that also help to make cats feel protected and safe within their environments. 1. Please give a brief description of Tuft + Paw and your products? We make beautiful, modern cat furniture that both cats and humans will love. 2. How did you first hear about eFulfillment Service? I did a ton of research online to find which 3PLs integrated with both Shopify and Amazon. 3. What challenges/problems necessitated a change in your order fulfillment? I am Canadian and most of my customers are American. While it might be easy for Americans to ship from their garage, it’s not at all feasible as a Canadian because the international shipping costs are prohibitive. At first, I used a 3PL who was near my hometown of Vancouver, but soon realized I didn’t actually need to be physically close to my warehouse. So I started looking for a 3PL who could seamlessly integrate with my shopping cart so that I didn’t need to worry about logistics and could instead focus on growth. 4. What trends in your industry drove the need to use our fulfillment services? The trend for fast service. Using a 3PL allows me to ship orders almost instantaneously without any delays. 5. What were you looking for in a fulfillment partner? Integration with Shopify and Amazon, as well as the ability to do small custom jobs, and inexpensive storage costs. 6. What made EFS stand out over others that you researched? The low storage fees, and small monthly account fee make it a really great option for people starting out. I also love that you’re able to have a dialogue with the staff vs some larger 3PLs who are a bit less human in their customer service. 7. How did our team here at EFS help with setup/implementation? They helped onboard me, get all my integrations setup, and make sure my first few orders went through smooth. The account manager, Steve Bulger, who was my first entry point is a great person who I can reach out to at any time – if I have concerns I know they will be addressed. 8. What was the initial reaction to our service? 9. How has our solution helped Tuft + Paw since moving to EFS? Lots of my peers spend their days shipping orders instead of growing the company. With EFS, I am able to focus 100% on growth and not worry about sending packages on time. 10. What have you been most impressed with? I love how I can email or talk to an actual human instead of being funnelled into a FAQ support database like lots of the larger companies do. You can get real help, and their staff really care. 11. What plans do you have to use our warehousing and fulfillment services in the future? Tuft + Paw is my third company, and all 3 are with EFS. I plan to continue growing and using EFS. 12. 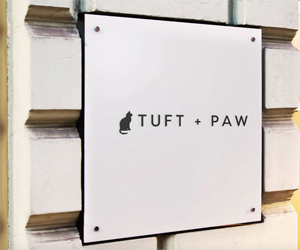 Is there anything else we should know about Tuft + Paw? We’re changing the way people think about cat furniture. Our team of engineers, designers, and cat behavior experts are rethinking cat furniture from the ground up.